Consider a situation when your mobile is stolen and it is not rooted. If an application is marked as debuggable then any attacker can access the application data by assuming the privileges of that application or can run arbitary code under that application permission. In the case of non-debuggable application, attacker would first need to root the device to extract any data. How to check for debuggable flag ? I will use Sieve to demonstrate this issue. Decompile .apk file using apktool then open up the AndroidManifest.xml file. Look for android:debuggable value in the AndroidManifest.xml file. 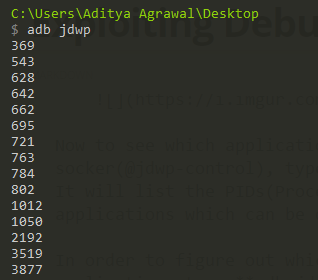 Now to see which application are connected to debugging socker(@jdwp-control), type adb jdwp in the console. It will list the PIDs(Process Identifiers) of the applications which can be debugged. 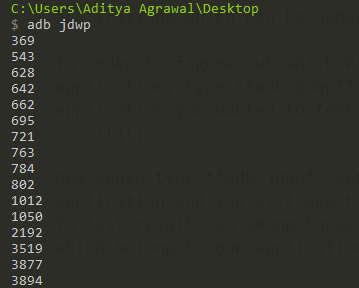 In order to figure out which PID belong to our application, type adb jdwp before running the application you wanted to test. Now again type adb jdwp after opening the application and you will see that there are PIDs added to last result, so among those PIDs there is one PID which belong to our application. In my case there is only one PID 3894 which is added . Now check whether or not this PID belong to this application, in case you have got more than one PID. It should output name of the application at the end of result like com.mwr.example.sieve in my case. Now to simply demonstrate what an debuggable application can do, i will extract data from application private directory. Now with the help of run-as binary we can execute commands as com.mwr.example.sieve application. Note: Above is the shell access of my personal phone which is not rooted. Now you can extract the data or run an arbitary code using application permission like shown below. But if you would try to access any other directory using this method, it won’t allow you because com.mwr.example.sieve doesn’t have access to it. Fix is very simple, just set android:debuggable flag to false in AndroidManifest.xml of the application.